People freak out when I call schmucks like this Taliban mullahs, but that's what they are. I worked on the building of the Academic Building a few years back and eh, 'frequented' McSorley's often. Very sad to see this little trooper tossed after 2 centuries. Imagine the residents popping down the block to McSorley's for an ale back in the day. A shame. Last edited by IrishInNYC; July 20th, 2012 at 12:50 PM. Bronx postal workers picket in front of the main Post Office for the Bronx on 149th street and the Grand Concourse in 2011. The U.S. Postal Service is selling the historic buidling. BRONXITES are furious over a plan to sell the Bronx General Post Office. The U.S. Postal Service has quietly listed the landmarked Mott Haven branch on the Grand Concourse for sale online. Interested buyers have until Wednesday to make an offer. One Bronx lawmaker is using legislation to urge the USPS to stop selling its historic buildings. Built in 1935, the four-story, 170,000-square-foot facility on the Grand Concourse and E. 149th St. that boasts up to 20-foot ceilings would be sold “as is,” and the buyer would have to agree to let the Postal Service lease the building for one year at $1 while it searches for a new site, according to the listing on www.uspspropertiesforsale.com. People line up for service inside the Bronx General Post Office. The U.S. Postal Service is selling the historic edifice. Serrano isn’t the only pol outraged that the sale is going forward. Bronx Borough President Ruben Diaz Jr. said he was livid — and said the U.S. Postal Service must get community input over its handling of the site. The potential buyers — if any — remained unclear Tuesday. A spokesman for CBRE, the real estate company handling the sale, declined to comment, and the USPS didn’t return calls or emails seeking comment. “It is the beginning stages of seeking realistic offers before moving forward with the sales process,” Chirichello said. “Any prospective buyers have the opportunity to respond to the ‘call to offers’ process, and all offers will be entertained." Chirichello, who chalked up the building sales to declining revenues and a drop in the use of the mail, said other city post offices have already been sold — including the James A. Farley and Peck Slip Station buildings in Manhattan. The agency proposed shuttering 17 post offices in the Bronx in 2012 to help plug a $20 million budget shortfall. The year before, it moved Bronx mail processing operations to Manhattan. One of the many large murals from the Depression on the wall at the Bronx General Post Office. “It’s choice real estate, but it was paid for by tax dollars and now it’s being sold to private interests,” said Chuck Zlatkin, of the New York Metro Area Postal Union. In December, the post office’s interior, which features 13 Depression-era murals, was designated a city landmark. The Bronx General Post office was designated a city landmark in 1976, and it’s listed on the National Register of Historic Places. Congress is set to vote Wednesday on an omnibus appropriations bill that includes provisions to pressure the USPS to halt the sale of its historic buildings until the inspector general weighs in on the legality of the sales, Serrano said. Serrano, the highest-ranking Democrat on the congressional committee on appropriations, which allocates money to the U.S. Postal Service, said he and other members of Congress had already expressed opposition to the sale of historic postal service properties — but to no avail. ^New article says proposal to turn it into a retail/recreation center. No. Unless it leaves the interior décor intact, but the renderings suggest otherwise. There was another plan to turn it into something similar to Chelsea market, but it doesn't look like that will happen. If this is landmarked, they shouldn't be able to completely transform the interior. The rendering in the article is for Kingsbridge Armory, not the post office. Sidenote: I might as well post this here, because Penn Station was the sacrificial lamb that brought about the LPC and historic preservation. We’re sorry to report that the former East New York Savings Bank at 91 Pennsyvlania Avenue will be demolished to make way for a seven-story medical building. A demolition permit for the four-story Renaissance Revival building was issued in December. I know this building. It's nice, sat empty for years. I'm sure the new one just won't compare. It's a shame they can't or won't just build on top of it. Roman Abramovich's plans to develop a $77m (€68m) mega mansion in Manhattan have been rejected and branded "a whole new level of egregious consumption". 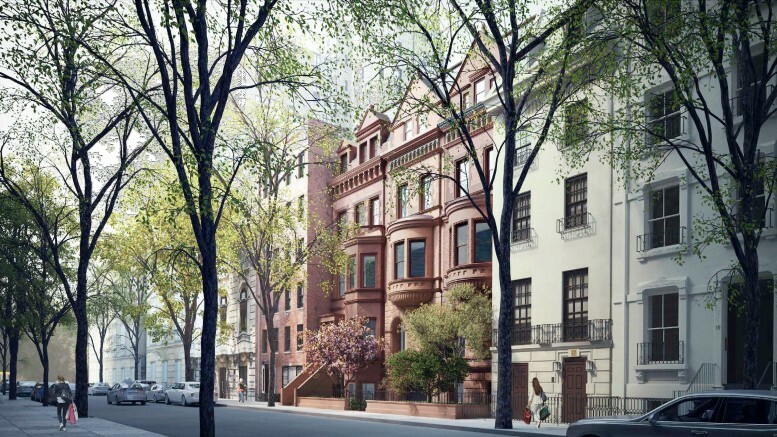 The Chelsea owner was told by the New York City Landmarks Preservation Commission that his proposal to turn three landmarked townhouses into one property was an "unjustified tear-down". The board - who must give approval before the development goes ahead - also said it would "erase a significant piece of history" and would "set a terrible precedent". Mr Abramovich was told by the group of historians and architects that there was "more than a dollars and cents price tag when one purchases history". Over the course of the past 18 months, Mr Abramovich has paid a combined $77m to buy 11, 13, and 15 East 75th St with the intention of turning them into a mega mansion. They are two Queen Anne-style terraced houses built in 1887-89. The other property was built in the Queen Anne style in 1887-89 and redesigned in the neo-Federal style in 1923. The application by Mr Abramovich, who is worth €7bn, is to carry out extensive renovations and to turn them all into a single 18,000sq ft five-storey home. The 49-year-old Russian wants to completely replace the front facade of one building, remove the party walls separating all three buildings and add a rooftop garden and a cellar. The rear would be overhauled to a bronze and glass design with gigantic bushes running from top to bottom, known as green walls. Inside there would be four bedrooms, a pool and sauna in the basement, an 'arts room', a library, a dining room on the first floor, a garden pavilion on the roof - and a hydraulic elevator. The New York City Department of Buildings has already rejected his plans and at a hearing the Landmarks Preservation Commission said no too. None of the Landmarks commissioners supported his plans and instead Mr Abramovich, who was not at the hearing, received a torrent of criticism. At the end of the meeting, the committee took no action, meaning that Mr Abramovich's developers have to come up with a revised proposal which will be examined at a later date. Mr Abramovich had similar problems when he set out to develop his £100m (€123m) 17th century mansion in Kensington, West London overlooking the Thames. It took three years before he was allowed to spend €12m knocking three properties together into one on Cheyne Walk, one of London's most expensive streets, and home to the likes of Mick Jagger. Residents feared they would lose light and that the development would cause a disturbance. Last edited by IrishInNYC; April 8th, 2016 at 08:43 AM.